Finally, someone recommended a Rachael Ray recipe to me! My friend Jenny mentioned that she tried Chipotle-Glazed Chicken Breast and Grilled Chopped Veggie Salad from Rachael Ray's Get Real Meals and that she and her husband really enjoyed it. I loved the novelty of finally having someone recommend a recipe to me instead of me recommending a recipe, so I had to make it. We are big fans of chipotle peppers in my house. If you've never tried them before, use this recipe as your excuse. They are smoked jalapenos and have some seriously great flavor. I was a little confused by the salad that accompanies this recipe, since it's grilled veggies, mixed with coleslaw, in a sauce that has yogurt or sour cream in it. But, for some odd reason, it works! This is a nice, healthy meal and with the addition of some whole wheat bread, you will have all your food groups covered! Preheat a grill pan or charcoal grill to high. While the chipotle glaze is cooking, season the sliced veggies, apple, and chicken breasts with salt and pepper. Drizzle with a generous amount of vegetable oil. Place the veggies, apple, and chicken on the grill. The veggies should be cooked in 3 to 4 minutes per side, or until they are well marked by the grill, then remove to cook slightly. The chicken should be cooked for 6 minutes per side. For the last 2 minutes of cooking time, baste the chicken using a pastry brush with the thickened chipotle glaze. Both sides of the chicken should be well coated with the glaze. Remove the chicken from the grill to rest while you put the rest of the grilled chopped veggie salad together. Chop the cooled veggies into bite-size pieces and transfer to a salad bowl. Add the coleslaw mix. In a small bowl whisk together the honey mustard, cumin, and the remaining 3 tablespoons of cider vinegar; stream in the remaining 3 tablespoons of vegetable oil while you continue to whisk the dressing. Stir in the sour cream or yogurt. Season the dressing with salt and pepper. Pour the dressing over the veggies and toss to coat. 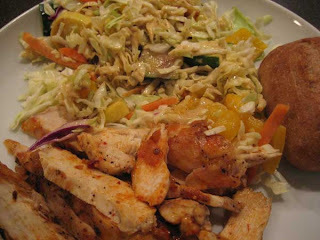 Slice the chicken breasts on an angle and serve them on top of a mound of the salad. mmmm that one sounds tasty! I also like her "sorta-soba" noodle bowls. I make the recipe several times each summer. I love being able to use fresh veggies from my garden! This year, I even get to use home-grown cabbage instead of the coleslaw mix. The only change I make is doubling the vegetables...the more the merrier! !